We’d love your help. Let us know what’s wrong with this preview of Green Lantern by John Broome. 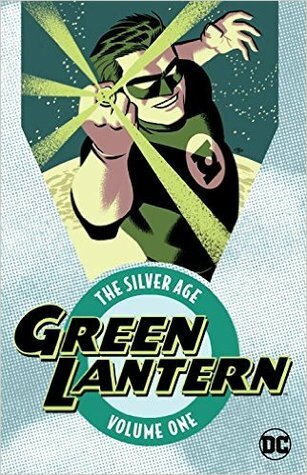 One of DC's greatest superheroes, Green Lantern, stars in this new trade paperback collection. These are the tales that introduced test pilot Hal Jordan, chronicling his origin story and establishing his role as one of the intergalactic peacekeeping force known as the Green Lantern Corps. Also included are the stories that introduced fellow Green Lanterns Tomar Re and Abin One of DC's greatest superheroes, Green Lantern, stars in this new trade paperback collection. These are the tales that introduced test pilot Hal Jordan, chronicling his origin story and establishing his role as one of the intergalactic peacekeeping force known as the Green Lantern Corps. Also included are the stories that introduced fellow Green Lanterns Tomar Re and Abin Sur, along with the corps' overseers, the Guardians of the Universe, plus Green Lantern's arch-foe, Sinestro. This is actually volume 3, no? This was a fun read, but I know now that I'm not into Silver Age comics. I just don't really find them that interesting (likely due to the CCA). I might pick up some Silver Age stuff if it's a character I really like, but otherwise I'll probably just skip it. C) Green Lantern's power ring doesn't work against anything the color yellow. If anyone should have short term memory loss it should be Green Lantern. He sure does get knocked out quite a few times in this collection. I'm sure he's sustained some sort of brain injury. This comic reminded me so much of The Flash: The Silver Age Vol. 1 in that Green Lantern doesn't have much of a personality. His stories for the most part have a simple adventure that GL resolves easily, with the rest of his time taken up with trying to repair his relationship with his bitchy girlfriend. Every character is rather flat. I guess that's why I was drawn to archenemy Sinestro. His pomposity was a breath of fresh air. Well, well, well. I didn't think there'd be so much familiar stuff this far back! Of course we have Hal Jordan and Carol Ferris. But we also have The Guardians, the planet OA, Hector Hammond, Sinestro (with a YELLOW Power Ring! ), the anti-universe of Qward, and much more besides. This is where GL REALLY started! Green Lantern: The Silver Age Vol. 1 is a collection of Green Lantern stories with Hal Jordan taking up the emerald ring. DC makes no excuses in a note at the beginning of the volume about how things weren't exactly sensitive in a lot of ways (*cough* Pieface *cough*) but its still a fun read for the most part. Definitely worth reading to see how far Green Lantern has come or if you're a fan of the character.